When the momentum indicator crosses above zero, the price trend is upward, and the indicator is signaling you to buy. When it crosses below zero, the trend is downward, and the indicator is signaling you to sell. Momentum can be a confusing indicator because your eye is accustomed to interpreting a line that’s pointing upward as having to do with the dollar value. But in this case, this upward line refers only to the speed of the price change. The distinction is driven home when you have a price that’s rising while momentum is falling. Divergence refers to momentum that moves in the direction opposite to the direction of the price trend. 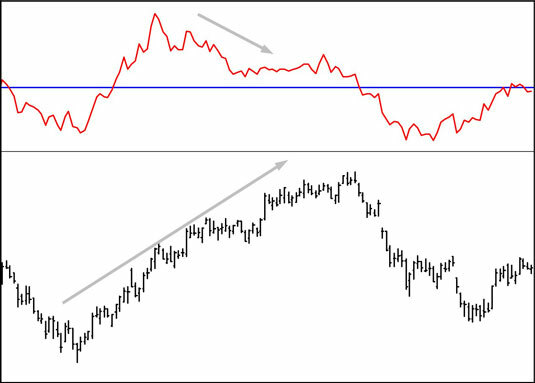 Divergence also refers to momentum higher or lower, but less high or low than a previous peak or trough, while the price trend is making a new higher high or lower low. Technically, they’re both going in the same direction, so it’s a misnomer to call it a divergence, but when momentum falls proportionately short of the price move, you can think of it as a failure to confirm. In this figure, the price is making a series of new highs, but about midway through the rise, momentum stops making new highs and starts going in the other direction. Then it flattens, meaning that the new price gains aren’t as robust as the older price gains. Momentum crosses the buy/sell midline on the very next day after the highest price high. This instance is an ideal example of using momentum as a buy/sell indicator in its own right. If you sell when the momentum indicator crosses the buy/sell line, you exit near the peak. A change in momentum is a reliable guide to a change in price trend. A new uptrend is almost always preceded by rising momentum. Most of the time, momentum peaks ahead of the price peak, generating divergence in the direction of momentum and price — a valuable warning that the trader should be getting ready to exit.